Solar Energy is already getting abuzz for powering up homes in the Philippines due to the country's location where it gets maximum exposure to the sun all throughout the year. In addition to this, the electricity cost in the country is one of the most expensive in the world as it is controlled by oligarchs. Storms frequently visit the country yearly and power supply from the grid usually goes down, but not for solar power. This article explains ways to power up your home through solar energy. 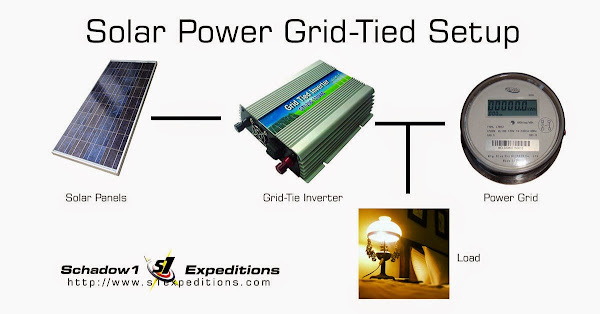 Know which is beneficial to you: to go Off-Grid or Grid-Tied. Grid-tied or also known as On-Grid is a type of solar power setup where you produce solar energy from the solar panels and share the energy generated to your local electric utility company. This is so far the less complicated setup for solar power to which the energy you produce is negated to your actual consumption and its excess can be sold to the power utility. This setup acts like a "power saver" which lessens your electric utility fees. The drawback of this setup is that you only produce electricity at day time and the system will not work during power interruptions. In Metro Manila and nearby provinces, the power distributor, MERALCO has already allowed the existence of Grid-Tied Solar Powered homes by registering to their Net Metering Scheme at a one-time fee of Php 19,000 as long as you consume at least Php 8,000 of electricity a month. MERALCO will then compensate you with the excess power you produce at around Php 5.00/kwh. - less than half of what they sell it to you at about Php 11-13/kwh. Is it a bad deal? Currently it is; if you do not spend that much electricity per month and you just belong to the middle social class. It seems renewable energy is new and is a threat to existing power producing companies in the country thus registering to the net-metering scheme for a grid-tied solar power is still a drawback for most Filipinos. Recently, TransCo, the grid distribution company in the Philippines and MERALCO, the electric franchise company for Metro Manila and nearby provinces is even proposing to the Department of Energy of increased rates due to existence of homes providing renewable energy such as solar. According to them, it entails additional cost to allow the proliferation of renewables. (ref: Transco Hike, Meralco Hike) However, I personally believe that they are going off the law of supply and demand in this case. Where due to the existence of energy self-sufficient homes (off-grid), the demand for grid power they supply must be declining thus, price must go down. If demand decreases (demand curve shifts to the left) supply remains unchanged, a surplus occurs, leading to a lower equilibrium price. With the drawback imposed by the energy oligarchs in country when going grid-tied, there is still a work around to ensure that the Grid-Tied system works in your home. This is by ensuring that your system produces power just exactly how your appliances need it. The watt-hour meters provided in Metro Manila are mostly, if not all, are uni-directional. This is implemented to prevent energy theft through reversal. Thus, when you produce more electricity than you use it, the excess power is actually given out to your neighbors for free while the electric company still earns from it as the meter still runs forward instead of backward, which unfortunately adds to your bill. The trick is to ensure that the energy you produce through solar must not exceed the energy needed by your appliances all the time. To do this, you may either limit the amount of solar panels providing energy to match your consumption using a cut-off switch; or get a grid-tie limiter which automatically senses the power produced and the power needed by your system and cuts off power production in real-time. 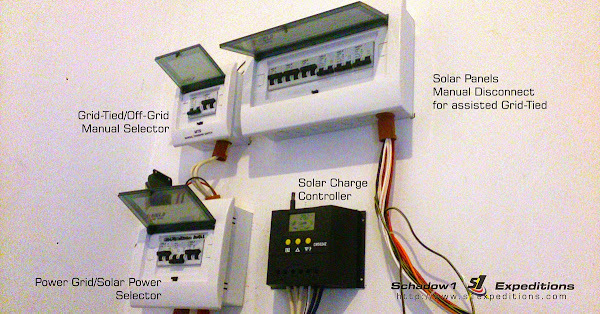 Currently the system I designed for my home is controlled manually by disconnect switches for each of the solar panels so the solar power production will adapt to the load while on a grid-tied solar energy. Solar Panels - to collect energy to the sun to Direct Current Power, and is mounted 10-12 degrees from horizontal facing south when you are in the Philippines. Grid-Tie Inverter - to transform the Direct Current to Alternating Current and synchronize with grid power. 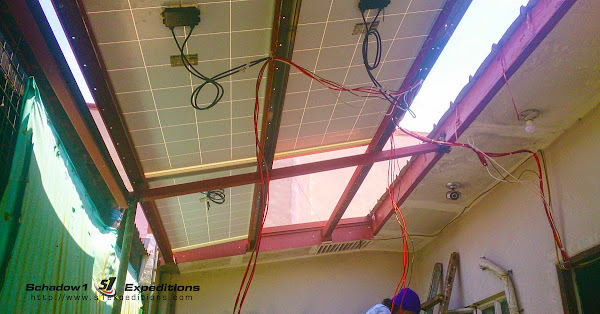 Properly sized wires that can accommodate high current from small voltage provided by the solar panels. For Wire-Sizing calculations, refer to this site. Off-Grid setup allows you to be independent from the power supplier in your area. Setting this type of solar power is more expensive than going grid-tied due to the existence of batteries to power up your home even at night time. This setup also entails the need to consult with electrical engineers to ensure the system designed is safe and will not catch fire as the home will produce its own electricity. Although more expensive, this is the absolute solution to homes that could not be reached by power suppliers and an ideal solution to areas mostly battered by storms. For those who live in urbanized areas with power suppliers, this is the solution to completely be independent allowing you to be self-sufficient and would not be affected by the power company's increased rates which happens more or less twice yearly. The more the power company increases its prices, the faster you can get an ROI (return of investment) from solar power. 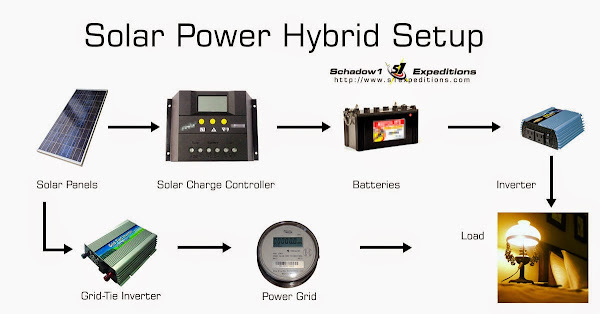 Precise calculations must be considered before planning an off-grid solar system setup. One must be able to compute the daily power requirements of your household; then from there base the power production of your system to get the right amount of solar panels to power your appliances and charge the batteries full at day time. And when night kicks in, the battery must withstand the power requirements of your home at night time before the sun rises the next day. Power Inverter - to transform Direct Current to 220V Alternating Current to power up your home. Batteries - to store power for your home and provide electricity in the absence of sunlight at night. 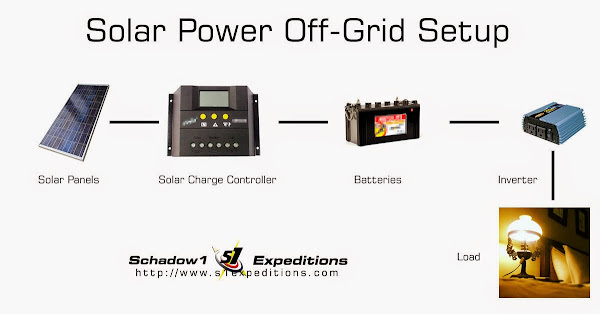 Solar Charge Controller - to ensure that sufficient amount of power are transferred to the batteries without destroying it. This system is a mixture of Off-Grid and Grid-Tied Solar Power. Where on day time, the energy collected by the solar panels are charging the batteries and at the same time, powering the Grid-Tie Inverter to lessen or zero out the power consumption of your appliances as shown on the watt-hour meter. And by night time, the charged batteries will then power up your home until the sun rises the next day. My home is currently running at an off-grid solar system and has been made ready for a hybrid setup. All of my appliances are powered by solar energy except for the air conditioning system. However once my project goes hybrid, the air conditioning system will also be covered. Due to this, the server running Schadow1 Expeditions blog is running green and is 100% powered by solar energy. More articles to follow on solar power implementation. Pretty neat explanation. We are also planning to have an off-grid solar power system as we are just starting a family, thus planning to build our own house. May I ask how much did you spend and how many kilowatts is your system? Will appreciate your response.